Yet another mass shooting has occurred — this time, the target was a Baptist church in Texas during their Sunday services. The killer killed 26 people, many of them children, injured 20 more people, and as the details came out (today, there was news about how he deliberately shot crying infants at point-blank range) my heart just breaks for all the victims that went through this ordeal. The victims their families, and that small town that lost so many of their friends and neighbors are in my prayers. Now, there is a lot of talk about prayers being useless. I’ve seen some people say things such as, “If prayers were effective, these people wouldn’t have died in the first place!” After all, the logic goes, they were praying before the gunman came and massacred them. Shouldn’t their prayers have saved them? And this kind of anger toward God after such a horrific tragedy is completely justifiable — it’s one of the hardest things that we have to grapple with as Christians. If God is good and all-powerful, then why does He allow so much evil to happen? If He truly loved us, wouldn’t He do anything to stop the evil from happening in the first place? Many a Christian has fallen away from the Church and Christ while grappling with this dilemma. So it’s important to remember what we, as Christians, understand prayer as, so that others may understand too. Prayer is not a sort of talisman that will protect us, no matter what. Prayer is not us rubbing a genie lamp so that we can get our wishes granted. Prayer is not a guarantee of safety, easiness, or a prosperous life. Prayer is entering into a conversation with God. When we Christians pray, we rush into the arms of Love Himself and we are free to confide all our thoughts and worries and fears with God. We remember how much we struggle and need God for everything. And yet, we also remember how much He loves us. And sometimes God will send us to places that we don’t want to go. 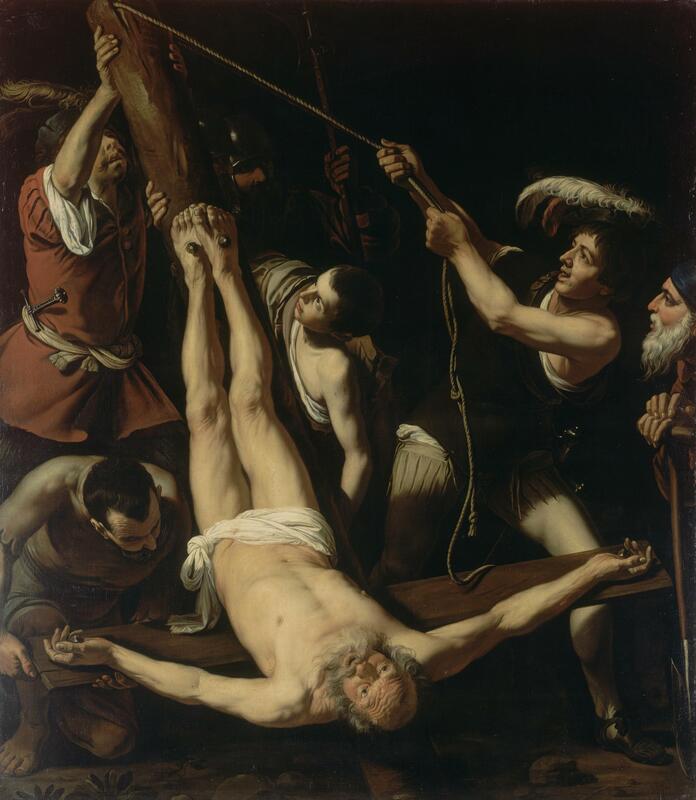 Martyrdom of St. Peter, by Caravaggio, c. 1571-1610. State Hermitage Museum, St. Petersburg, Russia. So, no. God doesn’t necessarily save us from bodily harm or guarantee us safety, even if we pray to Him devoutly. The Church has been founded on the blood of her martyrs, many of whom died in excruciating ways. The Agony in the Garden, by Jacques Callot, c. 1625. Devonshire Collection, Chatsworth, United Kingdom. It is a stark scene that relies on the few colors to make it even starker. To the right, Christ prays fervently to God. In answer to His prayers, an angel comes down, holding a cross and a cup to indicate what cup it is for Him to drink. At the bottom right, his disciples sleep, while to left a mob comes out from Jerusalem, ready to bring Him to His crucifixion and death. 21For to this you have been called, because Christ also suffered for you, leaving you an example that you should follow in his footsteps.22“He committed no sin,and no deceit was found in his mouth.”23When he was insulted, he returned no insult; when he suffered, he did not threaten; instead, he handed himself over to the one who judges justly. 24He himself bore our sins in his body upon the cross, so that, free from sin, we might live for righteousness. By his wounds you have been healed. 25For you had gone astray like sheep, but you have now returned to the shepherd and guardian of your souls. God knows us and knows that we suffered, for He has suffered the same things. Yet, by doing so, He has given all of us a chance to be received into His merciful arms. So, no matter the evil that we face in this world, let us return to the shepherd and guardian of our souls and hope in Him. And let us never be afraid to pray to God and rely on Him. Thank You for Your loving embrace. Listen to our prayers and petitions and be always at our side. We pray for the victims of the shooting, as well as victims of violence everywhere that they may be able to walk with You in Paradise. Your post is on here twice. Scroll down “The Power of Prayer ” and you will see.